There’s little doubt that Nintendo are smashing it with the Switch. After fumbling with the ball for the entire life of the WiiU, they’re back and nailing 3’s from everywhere on the court! …and this is for existing customers as well as new ones!! If you’re an Amazon Prime member…. you can link your Twitch account to Amazon Prime to become a Twitch Prime member! It’s included. Who knew!!!???!!! With NSO at £17.99 a year it’s not worth joining Amazon just to get Switch online. But it’s an awesome added extra if you’re a Prime user who owns a Switch. 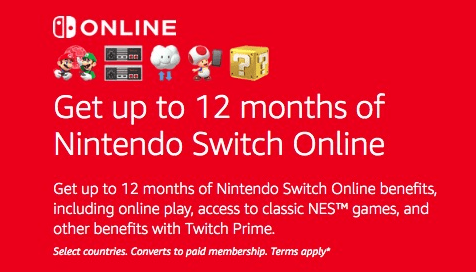 And if that’s not enough – if you’re already a Switch Online subscriber – you can stack the free months on top of your existing membership!! Yup – Nintendo are winning at life!! The downside with all of this is that, if you’re not already a Twitch Prime member, the process is ridiculously convoluted to set up and claim. And unless you know where to go, it’s been impossible to find any links to set this up by just logging onto your Amazon Prime account. Set up an Amazon Prime account. Be signed in. Set up a Twitch account and be signed in. You may have to confirm all of your payment and renewal info. Be mindful to switch it off if you don’t want to renew automatically. If you’re still conscious at this point, all of your accounts will be linked together and you’ll have Switch Online active. It’s a limited time offer – so grab it while it’s hot. I’m glad that’s over! So now go and enjoy some free Nintendo Switch Online!